So, back in the summer I was looking around for head shells for my amps. I was originally trying to get hold of Chris Uff since I'm in the UK but I had lost his contact. I put a shout out on the forum, I now have his e-mail thanks to neikeel but it took a few weeks and inbetween I started looking for alternatives. So I came across John Wheelers site, Stone age Custom Cabinets and was very impressed. 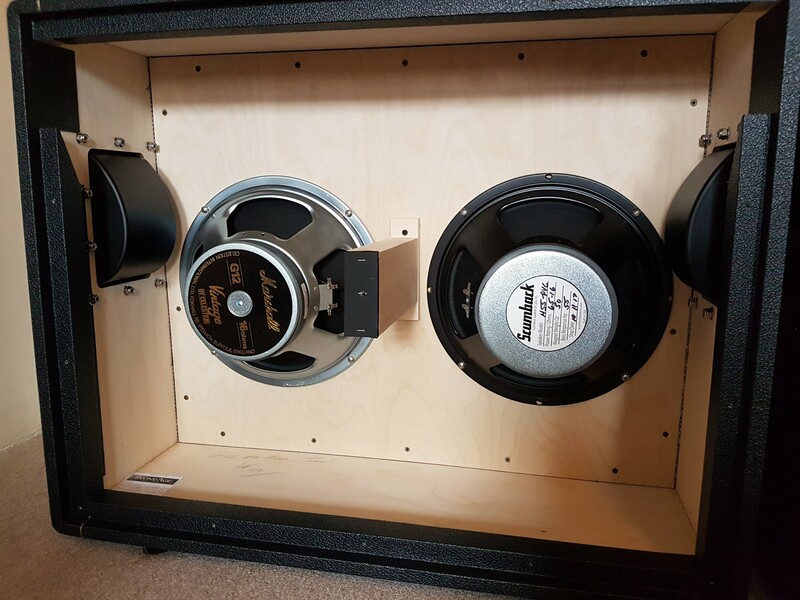 I wasn't initially thinking about picking up some speaker cabs until the amps were built but the more I read about them the more i was into it. 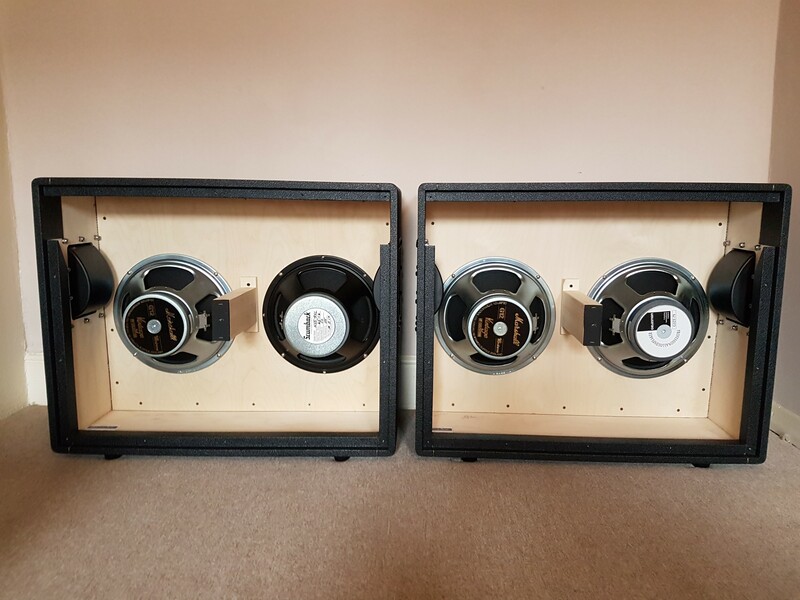 I had always intended to go with two 2x12"s so I could run two heads in parallel and thought if I was going to go through the importing process I might as well do it all at the same time and these cabs looked to be exactly what I was after. So I sent an e-mail to John and he said the best thing was probably to talk it over on the phone. So we set a time and made the call. So here's a tip, kinda funny now. When I made the call I should have contacted my phone network and baught a bundle to make the call, it would have cost me £15. But no... the phone company let me make the call and then afterwards cut me off. Lucky I had a work phone so I called them up and I had to pay a £100. Bill to get 're connected. To be honest I didn't really care but the young eastern European girl who dealt with my call, once I explained myself she was crippled trying not to laugh at my situation... she couldn't help her self. It blew her mind i could run up a bill like this and say Ok screw it let's just get this paid and move on. Lucky I have a good sense of humour and I could see the funny side and I did laugh. I've got to say John was an absolute gentleman to deal with. We talked through all the options and he gave some good advice, so we got the order squared away and talked some about music and shared musical tastes and by the end of the conversation I was sold. Last edited by revolver1 on Sun Mar 18, 2018 3:42 pm, edited 2 times in total. I also got in touch with Jim at Scumback because I wanted one of his H55's, as every one knows Jim is great to deal with as well. Jim said he would hold the speaker and send it to John when the cabs were ready so I could import it all together. Top man. 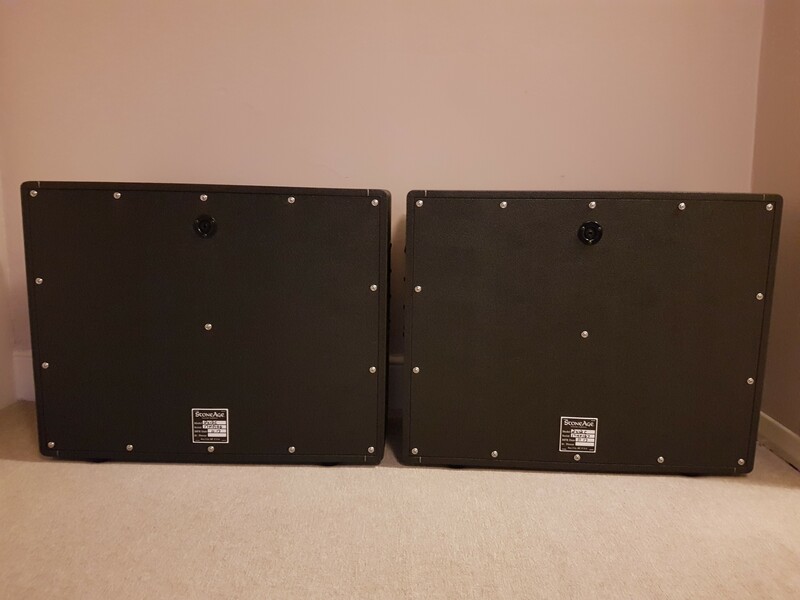 So this is the speaker combo's I'm going to start with, it may be subject to chainge but I think I'll be happy. A Marshall Vintage 30 and a H55 Scumback in one and a Marshall Vintage 30 and G12T75 in the other. 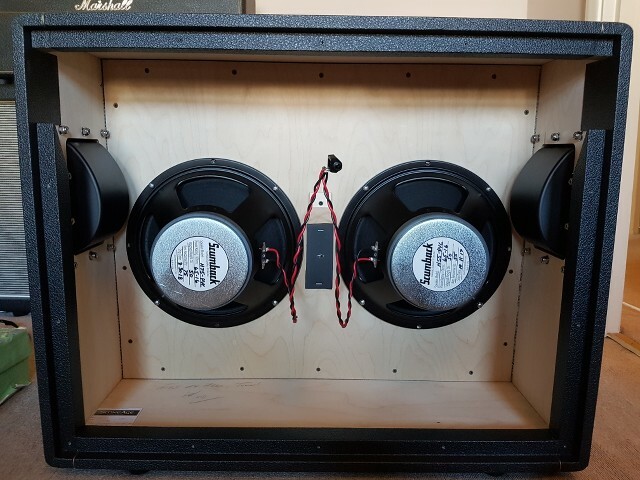 I put the G12T75 in between the two V30's to even out the mid's. Last edited by revolver1 on Sun Mar 18, 2018 2:33 pm, edited 4 times in total. Throughout the process John kept in touch with photos and updates as the build went along. It was great because throughout the week i'd be so caught up with work but come Friday John would have an update and I'd remember I have this all to come and i'd get all excited about getting the shipment. So here's a pic with the wiring loom all soldered up. I went with stranded 16Awg wire wich is 1.5mm UK. I have a confession to make i did mess up a bit. John actually supplied switchcraft jacks pre-wired with the vintage style metal jack plate. I had pre ordered the 16AWG wire and cliff sockets because I didn't know they would be supplied, I think John did tell me but I had forgotten. So when I soldered the speaker looms up and the jack sockets I realised the Cliff socket wouldn't fit to the jack plate because it caught on the ply. 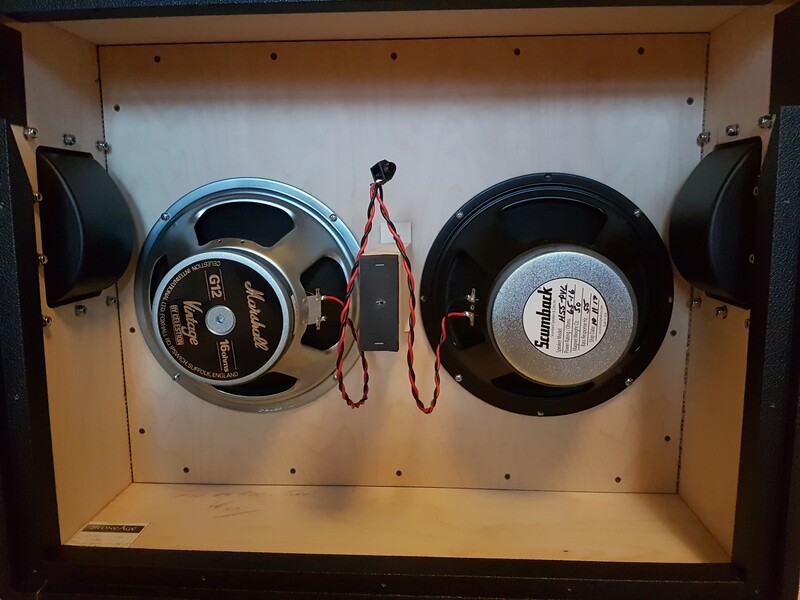 So I ended up having to drill it out with a hole saw and get some of the Marshall plastic recessed jack plates. It looks fine and on the plus side the jack plugs will be recessed but in hinde sight I wish I had just gone with what John had supplied, metal is much better. These cabs are built like tanks, the attention to detail is immaculate. Metal handles, castors that can be removed and the cab will sit on rubber feet. Solid Baltic Birch ply throughout. And the choices of finish ie Tolex and grill cloth. I couldn't be happier. Very, very clean work, John definitely takes pride in his product and I have to say it's first class. Last edited by revolver1 on Sun Mar 18, 2018 3:12 pm, edited 1 time in total. So here it is. The 2203 wasn't from John but the other three are and they are every bit as good as the speaker cabs, spot on. It honestly looks even better in the flesh. 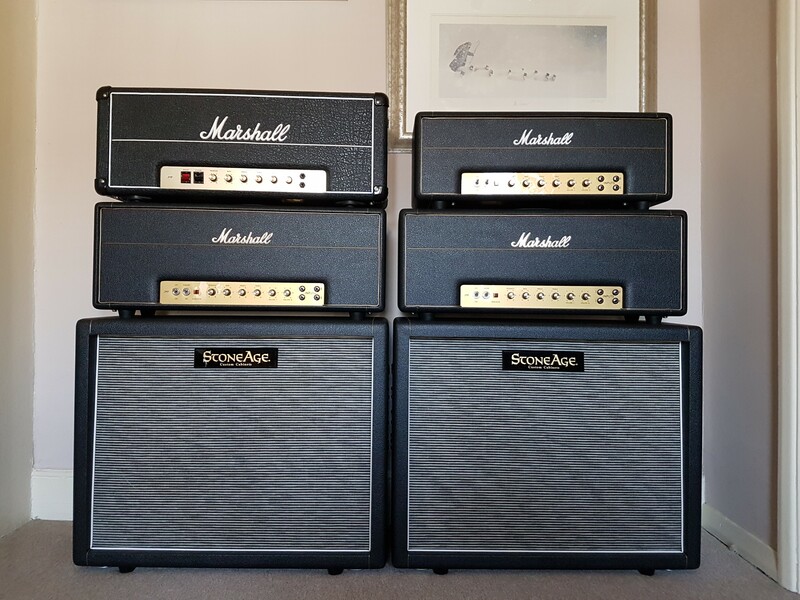 Originally I was going to put the Marshall logos on the cabs but you know what, the experience was so good as is the product so now there is absolutely no way I would ever, ever put a Marshall logo on these cabs they are StoneAge and that is that! I have got a couple of Aracom attenuators to take the edge off and am still waiting for transformers. I have ordered some pedals so building the pedal board may be next. So for now big thanks to John and Jim. Rock on! I bit the bullet and picked up a 75hz Sucmback from the man himself Mr Jim and paired it up with the 55hz Scumback and man does it sound sweet. I think they both really compliment each other. Sounds great with the other cab in a two amp setup, delay on one amp and reverb on the other. Yep, nice cabs, John does great work!